The state of São Paulo is a favorable area for karst formation. This occurs due to its geomorphology that presents lithological characteristics that favor the formation of caves and shelters in sandstone and limestone. Whether by speleologists or archaeologists, many archaeological sites in sheltered contexts have been discovered in the interior of São Paulo, however, their studies have not yet been developed in this state. 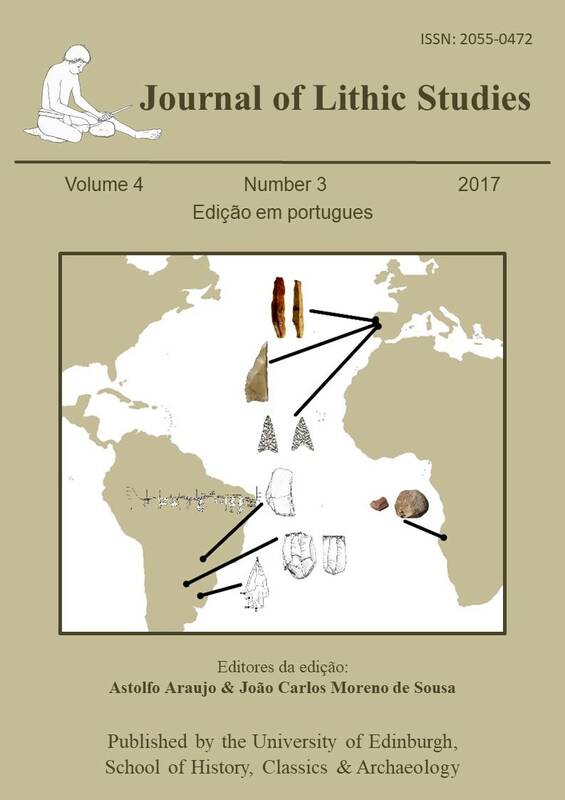 This article presents preliminary results of research at two sites in shelter contexts - that is, the Alvo Shelter [Abrigo do Alvo], locating in Analândia (SP), with the most recent chronology established at 970 cal. years BP and the oldest at 7,500 cal. years BP; and the Itapeva Shelter [Abrigo de Itapeva], located in the municipality of the same name, with a more recent occupation around 585 cal. years BP and the oldest being around 5,858 cal. years BP. Both sites have similar archaeological remains which are usually found in sheltered contexts: rock art, faunal material, and lithics artifacts. In this case, we have an exception in the Itapeva Shelter, which in addition also contains some fragments of human bones and ceramic material that was originally associated with the Itararé tradition, being comprised of small, thin vessels with little variation in shape, usually without decoration, and presenting colors between dark brown, gray and black. Although the diversity of remains is remarkable, this paper will deal only with the lithic industries which are in the process of analysis at both sites. In order to establish comparisons between the sites, the research team initially sought to recognize generic characteristics such as raw material, support, dimensions, and others. In addition to this, technological attributes were observed in order to extract information about the kind of flintknapping, use-wear traces and retouching. We do not disregard the other evidence, such as rock art as a clue that possibly indicates cultural difference, nor the presence of pottery in the Itapeva Shelter site which is an indication that the inhabitants of this area already had other technology that went beyond the use of stone tools. Although the analysis is not over, some differences already stand out, for example, different raw materials used in the manufacture of stone artifacts have been observed at both sites, as well as the techniques of flaking, which in the Alvo Shelter were much more simplistic and absent of any retouching, and in the Itapeva Shelter where materials associated with several stages of reduction have been noticed along with with the presence of some retouched artifacts. Despite the noted differences, one cannot disregard the fact that the sample of the first site is much smaller when compared to the second one. This is due to the fact that a single fieldwork season was carried out at the first site while three excavations were made at the second. Although this is one reason, one must also consider that the material density in the Itapeva Shelter is much higher when comparing the number of pieces per excavation unit. Lastly, the analysis of the lithic assemblages will continue but already they exhibit little similarity, thus supporting the hypothesis that we are not dealing with similar groups. Ferreira, R.V. 2005. Utilização de Sistemas de Informações Geográficas na Identificação de Unidades Geoambientais no Município de Analândia - SP. Dissertação de Mestrado. Instituto de Geociências, Universidade Estadual de Campinas, Campinas, 120 p. (em português) (“GIS using in geoambiental unities identification in Analândia municipality, SP”). Pallestrini, L. 1969. Sítio Arqueológico Fonseca. Revista do Museu Paulista, 19: 5-104. (em português) (“The Fonseca archaeological site”).